Thank you for your interest in working with Wyatt Communications. If you would like more information or to schedule an appointment, please feel free to contact us by any method below. The decision of purchasing business technology is becoming more complex everyday. What is it going to take and how much is it going to cost to do the job right? You are looking for answers to your questions. The more knowledge you hold the more empowered you are to make the right decision. Bill Wyatt has been helping clients answer these questions for decades. We know the industry, we know the products, we know how to apply them. Give us the opportunity to make technology work for you. 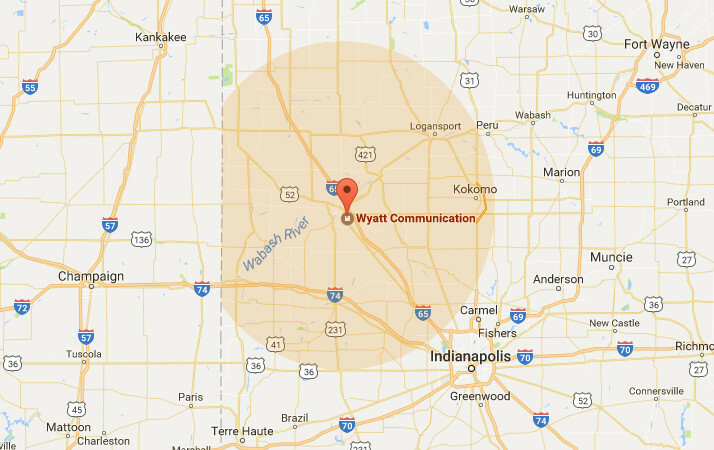 Based in Lafayette – serving north central Indiana, including the towns of Rensselaer, Kokomo, Crawfordsville, and others in a 60 mile radius. We are happy to support clients outside of our defined service area, but additional travel charges may apply. Please call us for additional information or referrals to quality service providers in your area.